LG's pre-event announcements are getting earlier and earlier with the company confirming the arrival of its new L Series III Android phones more than a week before MWC 2014 kicks off in Barcelona. 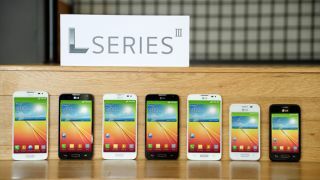 The third-generation L Series phones - the L90, L70 and L40 - come with a variety of display sizes and specs, but each have the latest version of Android 4.4 KitKat on board. The handsets are all in the mid-range area, but the L90 has a 1.2GHz quad-core processor, a 4.7-inch 960 x 540 display, 8GB of internal storage, 1GB RAM, an 8-megapixel camera and 2540mAh battery. The L70 is slightly smaller at 4.5-inches (800 x 400), houses a dual-core chip, 8-megapixel camera, and 1GB RAM, but on-board storage is slightly lower at 4GB, while the battery pack comes in at 2100mAh. Finally, the L40 is dinky at 3.5-inches, also has a 1.2GHz dual-core processor alongside a 3-megapixel camera, 4GB of storage, 1GB RAM and a 1700mAh battery. All three devices will be on show at MWC, which begins in earnest on February 24. We'll be on hand at the LG stand to take a look.